Johnson & Johnson Innovation: a model for pharma partnership? As collaboration and open innovation become the key drivers of successful new medical advances for a maturing pharmaceutical industry, Paul Tunnah speaks with Patrick Verheyen to hear more about Johnson & Johnson Innovation’s approach to partnership. Within an increasingly collaborative healthcare environment, the pharmaceutical industry is further recognising the value of supporting and nurturing external innovation, combining its development and commercial expertise with early scientific translation. This is equally important for a start-up medical enterprise, where early-stage funding and support is hard to come by. Patrick Verheyen, Head, Johnson & Johnson Innovation, London speaks with pharmaphorum’s Paul Tunnah about his work at the Innovation Centre in London. PT: What is the objective for the London Innovation Centre? PV: The ultimate goal for us is to help bring new products to patients and consumers that can truly change disease management or even halt disease progression, whether they come via academia, clinical centres, biotech companies or the government. It has to be about advancing patient care. People talk about an innovation gap, but this is not the problem – the gap is in translating innovative science into medical advancement. This can only be achieved by bringing the best people within the healthcare community together. PT: Pharma has always been collaborative in drug development, so why is the timing right now for the Innovation Centre? PV: We are fortunate to have great scientists in J&J, but we also know that a lot of the expertise is in the broader ecosystem – pharma and biotech does not have a monopoly on talent. We see an opportunity to create synergies between larger entities like J&J and these more entrepreneurial environments. We can bring our drug discovery capabilities, resources and insight to marry it with their emerging science. The venture capital resources of Johnson & Johnson Development Corporation (JJDC) co-located in our innovation centres and we also co-invest with other VC companies. , In general, there is an appetite for J&J to support earlier and earlier. However, this is not a new initiative but merely an extension of the way that we have been trying to source and foster innovation for several years, which is now reaching a critical mass. As it gathers momentum and our partners are more successful, then the more products we can take through to late stage development and the more opportunities we have to work on further collaborations. PT: What else does Johnson & Johnson gain from this initiative? PV: We know that developing a pharmaceutical product or medical device is a very long, expensive and risky process, so the more understanding you have of the science then the better we can manage this. If we can use this knowledge to better direct our development resources then it stops being a gamble to pick the right target or antibody, but educated direction that will yield the best product for patients and a more robust process for us. But again, we also know that smaller, more entrepreneurial entities can be more efficient at early translation and starting that science moving. PT: What are the biggest success stories so far with the London Innovation Centre? PV: It’s hard to measure specifically as it is still quite early, but we entered into a quite a number of fruitful collaborations last year. For example, we entered into an agreement with a company in the Netherlands called Bioceros and more recently launched a biotech incubator in Israel that will enable us to help support start-up companies focussed on early translation through a collaboration with Takeda Pharmaceuticals, OrbiMed Israel Partners and the Office of the Chief Scientist in Israel. The increased communication and proximity with academia and early biotech/medtech companies happening in London, in Menlo Park (California) and in Cambridge (Massachusetts) is really building trust and close collaboration, which is leading to all kinds of interesting partnerships. PT: How do you see this kind of collaboration developing in the future? PV: Well, to ensure that the products used by patients are safe and effective you have to go through the traditional phase I, II and III development. But through smart collaboration you can accelerate that process and better direct it, plus with really outstanding innovation derived from partnership there is the opportunity to secure accelerated approval, so this is an exciting focus for us. 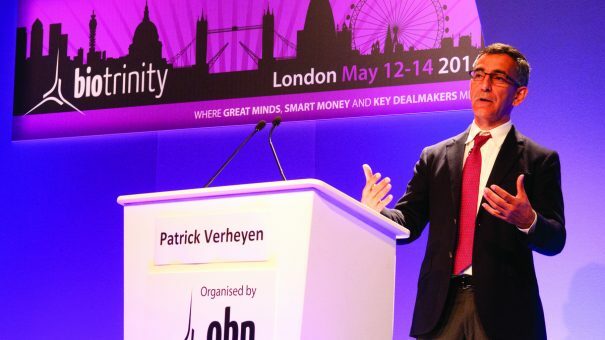 Patrick Verheyen is Head of the Johnson & Johnson Innovation Centre, London, which seeks to advance the development of new healthcare solutions by fuelling the best science through collaboration and exchange of ideas. Johnson & Johnson Innovation represents a new approach to partnering aimed at advancing early-stage innovation, with teams of science and business experts, based in regional innovation centres, collaborating with innovators to accelerate cutting edge science into healthcare solutions.